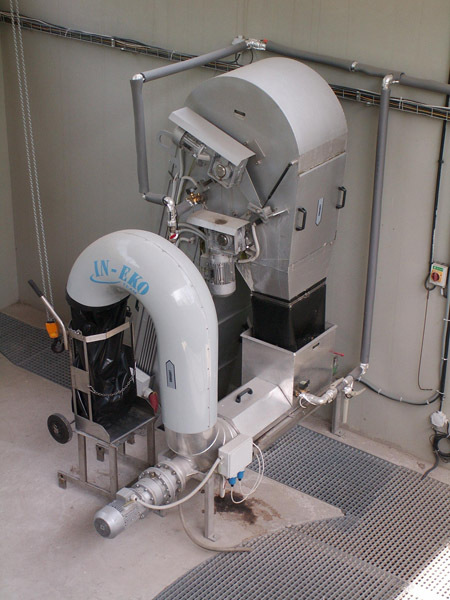 The In-Eko Mechanical Bar Screen is an automated self-cleaning bar screen primarily used for headworks screening of the influent wastewater before entering the treatment plant. It has also been used in freshwater applications to screen the water before entering potable water plants. The supporting structure of the screen is fabricated of non-corrosive 304 stainless steel while the screening belt is formed of an aircraft grade polyamide/fiberglass composite to ensure a long life and peak performance. The screenings brush situated in the head of the screen is made up of durable polyamide fibers to sweep the belt clean. The sprockets and belt guides attached to the drive unit and screening belt are a polyamide nylon that never needs lubrication. Our Mechanical Bar Screen is installed into a concrete channel and each is custom built for your application. For most applications, screening belt openings of 1, 3, 6, and 12 mm are available. However, custom openings can be accommodated. Each screen is factory tested and inspected to ensure that you will receive a high-quality product that will do the job. Critical inspection points include a detailed visual inspection on all welds and material craftsmanship. During the mechanical and operational testing of the screen, the control panel is tested as well as the overload feature. The overload feature is tested by applying a weight (determined by screen size) to the belt. The overload feature is activated when the threshold weight is breached and a sonic and visual alert is activated. The In-Eko Mechanical Bar Screen is another solution from Purestream ES, LLC that will help the overall bottom line of your project by providing a cost-effective and heavy-duty piece of equipment that operates using less connected horsepower and is easy to operate and maintain.